The design of Arch Linux’s follows KISS principle (“keep it short and simple”) as the general guidelines which mean you will only get a minimal base system from the OS installation and have to configure the system further to use it. 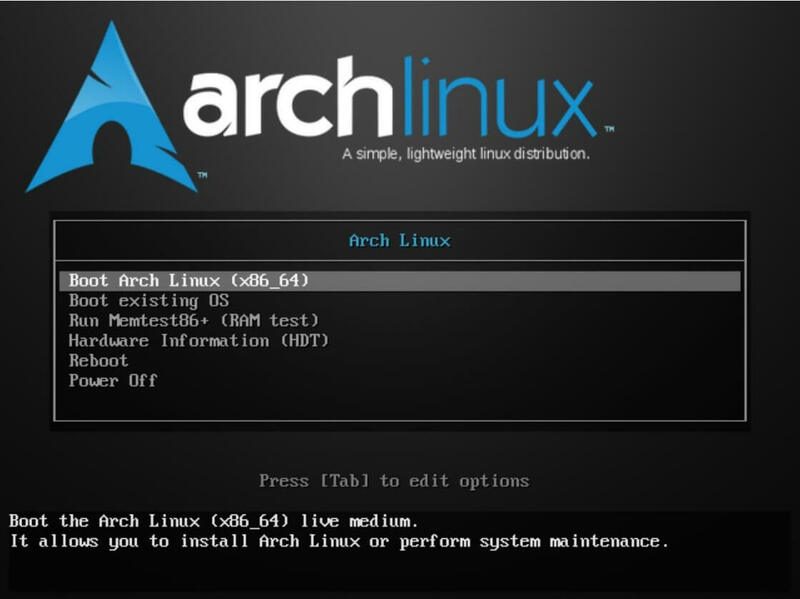 Arch Linux offers new packages/updates on the rolling release model, i.e., packages are provided throughout the day. Pacman (Arch Linux’s package manager) allows users to keep systems updated easily, daily. Arch Linux has dropped support for 32bit OS from Feb 2017 and now supports only x86_64 installation. USB flash drive or Blank CD for burning the installation image. Here, we will see how to install Arch Linux latest version (v 2018.04.1) from USB / CD. 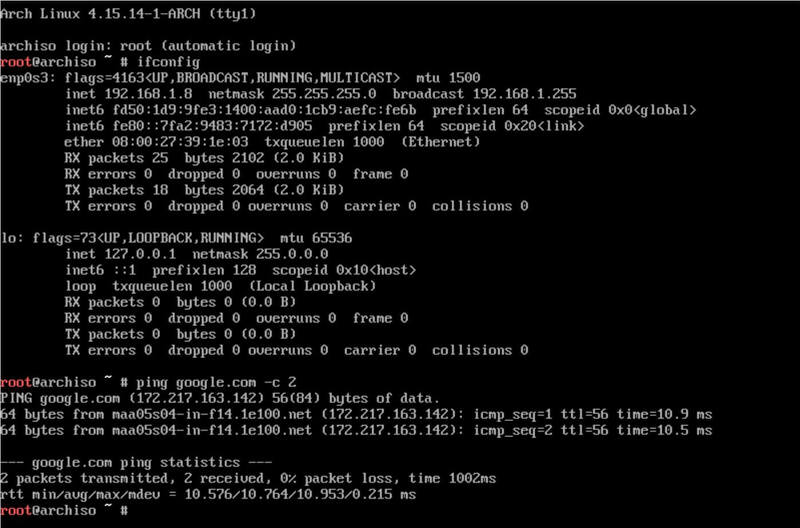 Arch Linux installation process requires an internet connection to retrieve packages from a remote repository. Download the latest version of Arch Linux from the official website. We will now create a live USB / write a bootable CD from the downloaded ISO image. Replace /path/to/archlinux.iso with the path to the downloaded ISO file and /dev/sdx with your USB drive name. Replace /path/to/archlinux.iso with the path to the downloaded ISO file. Power on your system and press F2, F10 or F12 to change/select the boot order. Once system boots from Live USB or CD, you will get an installer screen, like below. Choose Boot Arch Linux (x86_64) and then press Enter. Finally, after various checks, you will get a root prompt. As I said earlier, the system needs an internet connection. 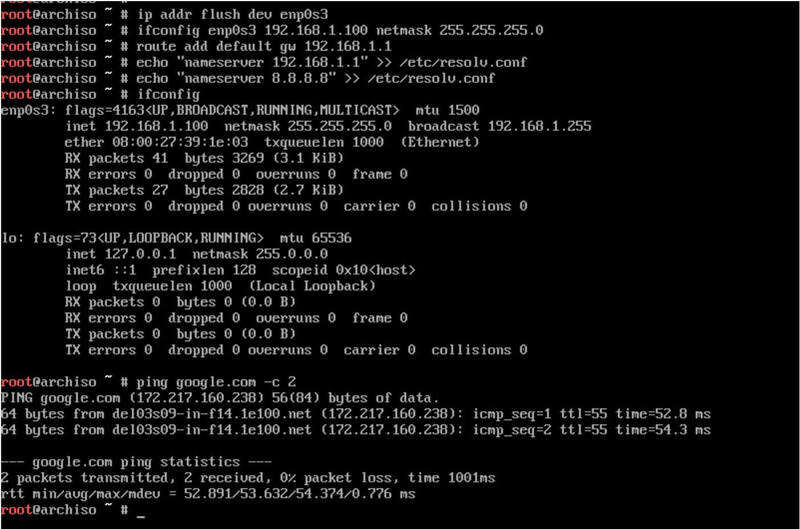 If your environment has a DHCP server, then the system will get IP Address automatically. If your system does not get a reply, then configure static IP address on your system so that your system can connect to the internet to download packages. Replace network card and IP address according to your environment. We will now create the partitions on the hard disk for the OS installation. First, list the available disks using the fdisk command. The system has a 40GB disk (/dev/sda) and will use that disk for OS installation. The name of the disk varies depending upon the system. The disks can have other names such as vda, hda, etc. Now, we will use fdisk command to create partitions as per the requirement. Partition details are shown below. Once you have created partitions, use p to confirm the creation of partitions and then, w to save the changes. Verify parttions using the fdisk -l command. We now have three partitions. Now, its time format the created partitions with the required file systems. 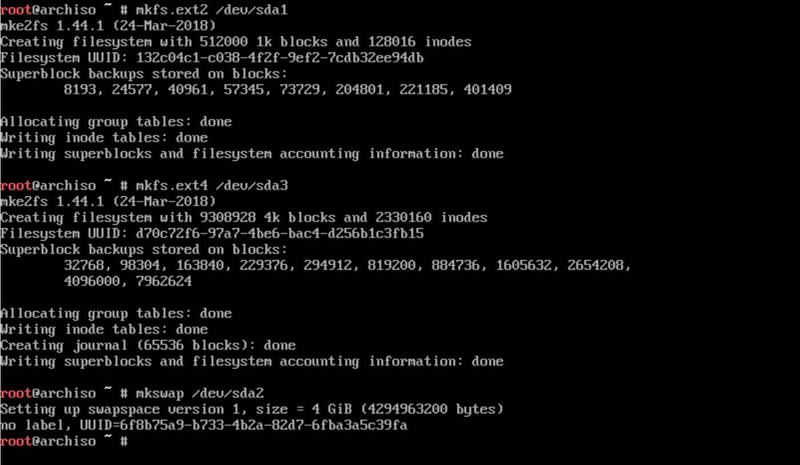 You can format /boot (/dev/sda1) as EXT2 or EXT3, SWAP (/dev/sda2) as SWAP and / (/dev/sda3) as EXT4 filesystem. Once you have formatted the partitions, use the mount command to mount it. / (root) partition must be mounted on /mnt directory. Also, you would need to initialize the swap partition. If you have additional partitions, then those need to be mounted on the respective directories on /mnt. For Ex: /home partition needs to be mounted on /mnt/home. Now, its time to install Arch Linux base system. The installation will take at least 15 to 30 minutes to complete depending upon your internet speed. The below message confirms you that the Arch Linux Installation has been completed successfully. After the base installation, generate the fstab file for the system using the genfstab command. 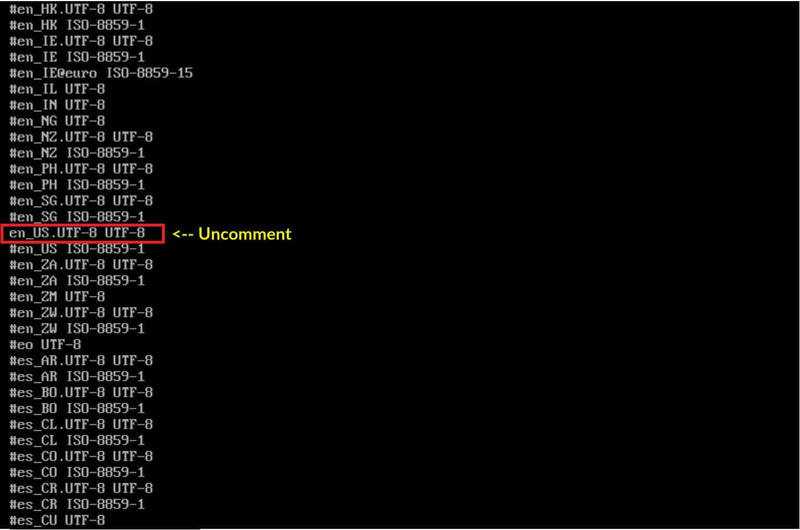 Verify the fstab entries using the below command. You can configure the system language by uncommenting the required languages from /etc/locale.gen file. Uncomment en_US.UTF-8 UTF-8 for American-English. Set the system locale by placing the LANG variable in /etc/locale.conf file. Now, configure the system time zone by creating a symlink of your timezone to /etc/localtime file. You can find the available timezones under /usr/share/zoneinfo directory. Also, set the hardware clock to UTC. Place the system hostname in /etc/hostname file. Use the passwd command in the terminal to set the root password. 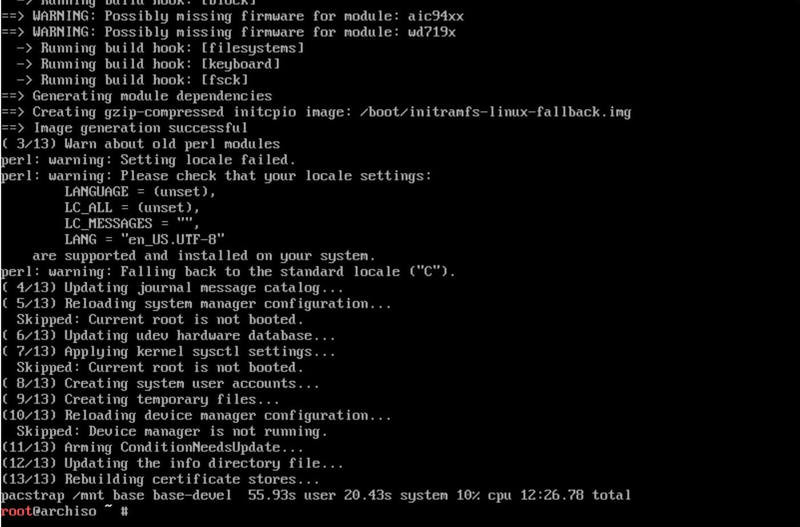 Arch Linux requires boot loader to boot the system. You can install grub boot loader using the below commands. Exit from chroot system and then reboot. Once the reboot is complete, you would get the Arch Linux login prompt. Log in as the root user and the password you set during the os installation (step 13).